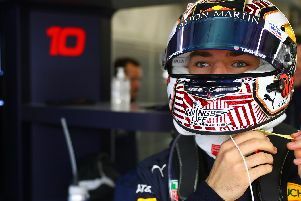 Daniel Ricciardo will start from pole position at Monaco after a sensational performance in qualifying on Saturday, but team-mate Max Verstappen will start at the opposite end of the grid. Ricciardo’s remarkable lap of 1:13.622 sees him head the field, ahead of Mercedes duo Nico Rosberg and Lewis Hamilton. It is the Australian’s first pole position of his career, and the first for Red Bull Racing since 2013. And to make it even sweeter for Ricciardo, he will start the race on the longer-endurance super soft Pirelli tyres after another sensational lap in Q2 saw him second on the timing sheets, while most of his rivals will be on the faster ultra-soft tyres, though it is notoriously difficult to overtake around the streets of the principality. But it wasn’t all good news for the Red Bull Racing team. Max Verstappen, winner last time out in Spain, crashed into the barriers at the exit of the Swimming Pool chicane in Q1, eliminating him. Speaking about his accident, Verstappen said: “I turned in a bit too early, clipped the wall and broke the suspension. Then we went straight into the wall. “It was all beginning to come together, the car felt good, I had the balance right and my sector times were getting better.